The Pacific Institute continues to be at the forefront of sustainable water management and stewardship, locally and abroad. As we embark on a new year filled with ground-breaking analyses and innovative solutions, we would like to share our key victories in 2014. 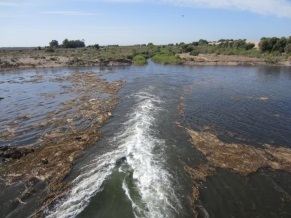 For nearly two decades, the Pacific Institute has called for returning water to the Colorado River Delta. In March it became a reality, with an eight-week restorative flow from Morelos Dam. Following five years of collaborative efforts, the CEO Water Mandate released its Corporate Water Disclosure Guidelines, which offer a common approach to business reporting on water-related issues and put forward metrics and approaches to help inform and guide businesses in how they disclose water management practices. We briefed the White House, Governor of California, and members of the intelligence community on issues ranging from the California drought, to the influence of climate change on extreme events, to the Ebola crisis in West Africa. After many years of pushing for sustainable groundwater management, we were thrilled California’s legislature passed a first-ever groundwater law that is an important first step in protecting the state’s groundwater. Take a look at some of our other achievements over the past year, along with a preview of some of our 2015 upcoming projects. 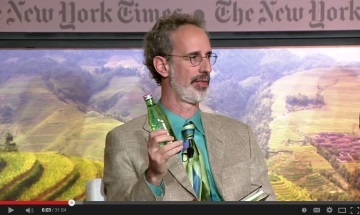 The Institute kicked off the year with the release of The World’s Water, Vol. 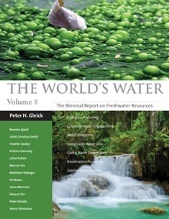 8– the latest volume of our biennial freshwater resources report. It addresses a myriad of pressing issues including water conflict, the water footprint, water governance, and more. Read select chapters here, or purchase a copy of the entire report. *The Journal of the American Water Resources Association calls it “a ‘must have’ reference for anyone interested in the water resource field”. nearly two decades. 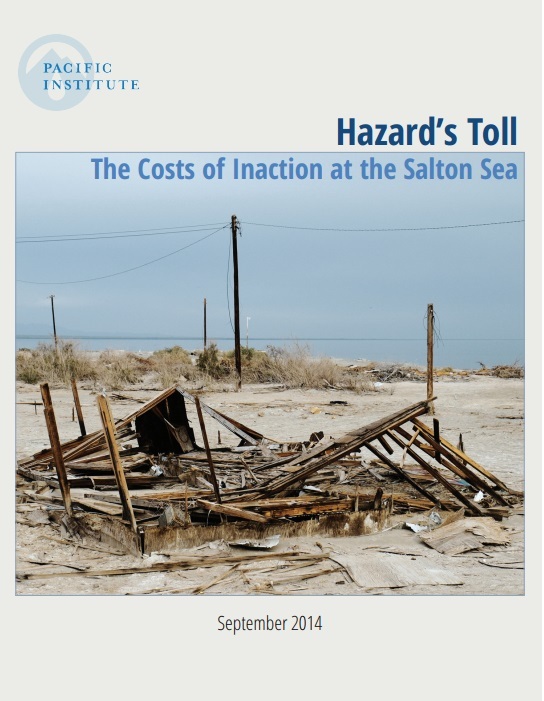 Hazard’s Toll: The Costs of Inaction at the Salton Sea highlights the public health and environmental hazards affecting this area. The report reveals the continued failure to protect and preserve the Salton Sea, which has led to worsening air quality, and the loss of valuable ecological habitat – combined with diminished recreational revenue and property devaluation – could cost as much as $70 billion over the next 30 years. The Imperial Irrigation District, informed by the report’s findings, sent a petition to the state water board asking it to take action on the Salton Sea and hold up its end of the deal with the expected restoration plan. *Our research on the Salton Sea was featured more than 150 times in the media last year including The New York Times and the Los Angeles Times. 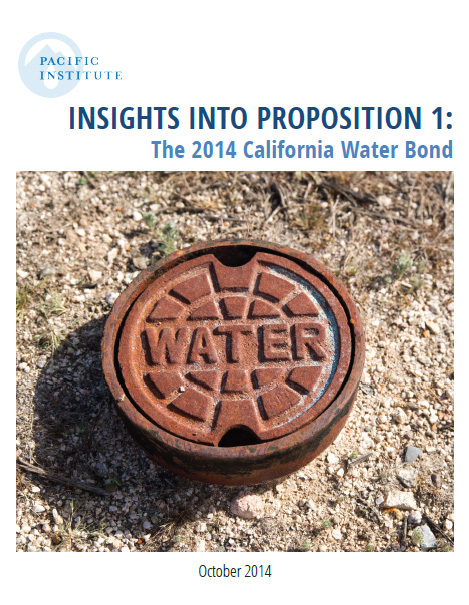 Prior to the November elections, the Pacific Institute provided voters insights into Proposition 1, the California water bond. The Institute did not take a stance regarding the $7.12 billion bond, but instead offered sound analysis of its key provisions and its implications for California’s water. The Pacific Institute’s work was highly regarded, including Governor Jerry Brown seeking our perspective on the bond. *This timely report received the most initial downloads than any of our other reports. It was downloaded more than 2,000 times. The Pacific Institute’s water footprint assessments are helping to shape California’s water policy and providing valuable insight on water use trends. They were highlighted last year in an article published in the Journal Water Resources Management, along with being featured in the California State Water Plan. The article describes how water footprint assessments can be relevant to policy when scaled to geographic areas where water-related decision making occurs. 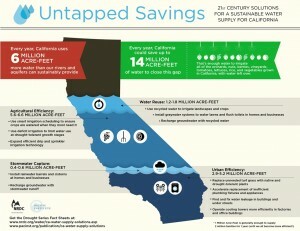 As indicative of this, the State Water Plan used the state’s water footprint as a sustainability indicator. An analysis written by Peter Gleick in the peer-reviewed American Meteorological Society journal “Weather, Climate, and Society” addressed the links between severe drought in the Middle East, water management, climate change, and the devastating civil war in Syria. *The article was the “most-read” for that journal in 2014 and was widely discussed in the international security community. The Pacific Institute continues its work with the CEO Water Mandate, an initiative that helps companies translate their responsibility to respect human rights to water and sanitation into their existing water management policies and practices. 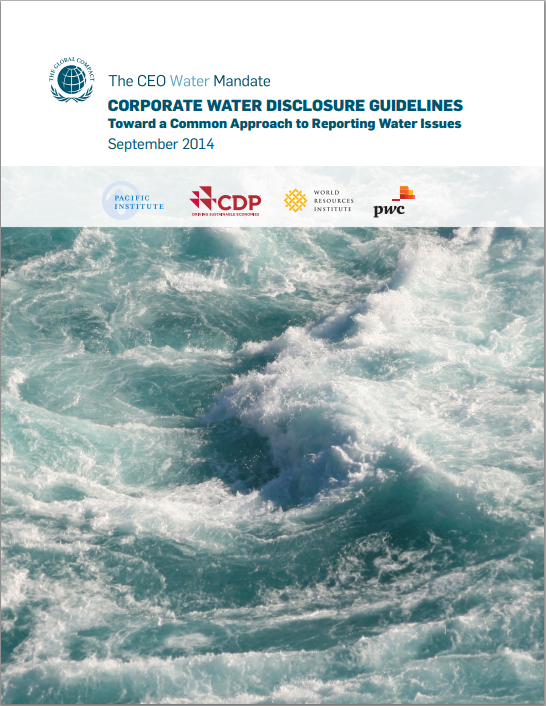 In a multi-year, highly collaborative effort, the CEO Water Mandate along with the CDP, Global Reporting Initiative, World Resources Institute, and PwC launched a common sense approach for corporate water use disclosures. This effort uses years of water assessment and disclosure metrics and tools to build a framework for the most meaningful and effective ways of disclosing corporate water management practices.These guidelines will influence the way businesses measure their water performance, assess conditions, understand their risks and impacts, develop strategies, and communicate to stakeholders. Alliance for Water Stewardship (AWS), of which the Pacific Institute is a founding partner, launched the AWS Standard, a global framework to promote sustainable freshwater management and stewardship. Major corporations like NestlÃ© and General Mills announced their commitment to AWS in the culmination of a four-year process involving business, public sector, and civil society interests from around the world, as well as pilot projects held in seven countries. 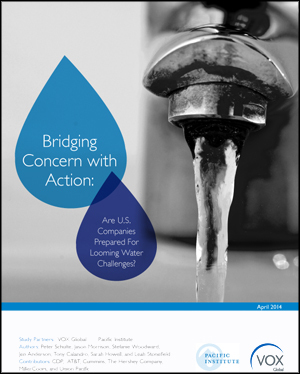 In a partnership with VOX Global, the Pacific Institute conducted a survey of major U.S. corporations to document their perspectives on the key water-related challenges they face. The survey’s results revealed that most companies believe water challenges will significantly worsen in the next five years. The Corporate Sustainability team continues to shed light on unsustainable practices where they exist, highlight examples of beneficial corporate action, and ultimately help determine the most appropriate role for the private sector in addressing our shared 21st Century water challenges. *This paper was featured in major media outlets’ reporting including Forbes. 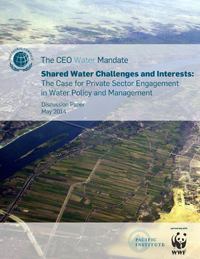 A discussion paper from the CEO Water Mandate and the World Wildlife Fund makes the case for private sector engagement in water policy – responding to the question of whether such strategies truly advance the public interest. This paper addresses and refutes recent criticisms of corporate water stewardship and collective action approaches and makes a case for the role of business in advancing sustainable water management. Sharing Ways of Improving Sanitization through Corporate Action The CEO Water Mandate released the study Exploring the Business Case for Corporate Action on Sanitation regarding poor sanitation systems in the Global South, where millions of children die each year due to unsafe water and poor sanitation. 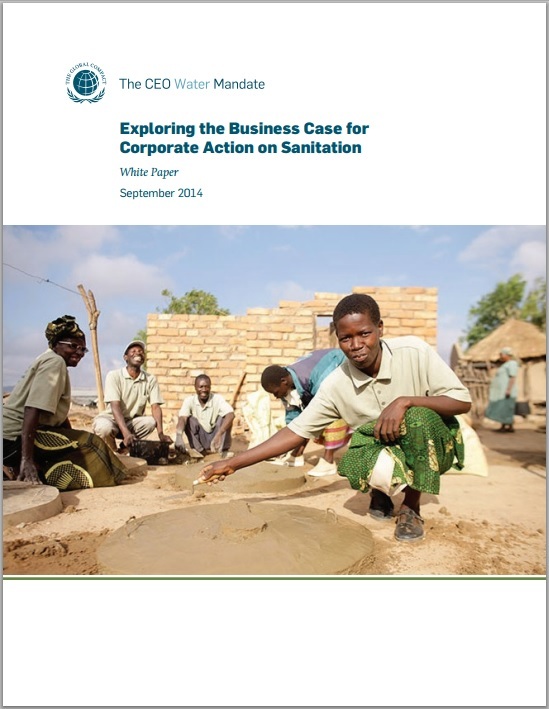 The report identifies key ways the sanitation crisis can impede business success, as well as recommendations for companies to improve sanitation in the communities in which they operate. 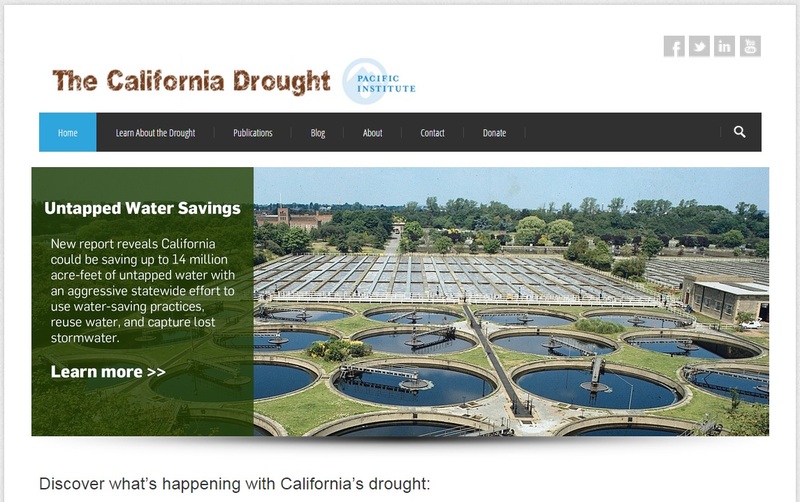 The Pacific Institute launched the California drought website (www.californiadrought.org), a repository of information, analysis, statistics, and solutions to challenges created by the California drought.The website provides a user-friendly portal to the latest California drought news and research. Each week during the summer, our drought response team provided a weekly drought update featuring the most recent news, figures, and resources regarding the drought. During the winter season, drought updates will continue biweekly. *Our drought work was mentioned more than 1,000 times by media outlets last year. conservation and efficiency could reduce demand by 9.5 million to 11.8 million acre-feet per year and water reuse and stormwater capture could augment local supplies by 1.6 million to 2.4 million acre-feet per year. Together, these practices could reduce pressure on the state’s over tapped surface and groundwater resources. Following this report was the release of our corresponding white paper and infographic on the benefits of reducing both total water use and water consumption in agricultural practices. *The Untapped Potential Briefs were downloaded more than 15,000 times last year. They were also featured in major media reporting, including the lead editorial in The New York Times. As of last fall, the Pacific Institute has a new internal program structure, with renewed focus on its key strengths of research and policy work in the areas of water, climate, and environmental sustainability at global, national, and regional scales. As part of the Institute’s redesign, the Community Strategies for Sustainability and Justice Program (CSSJ) was closed as a separate program. The Pacific Institute’s core principles of equity, sustainability, community engagement, and public outreach have been integrated directly into other programmatic activities. The Pacific Institute will continue to partner with community organizations and social justice groups by providing research and communications tools that will assist them with their work. 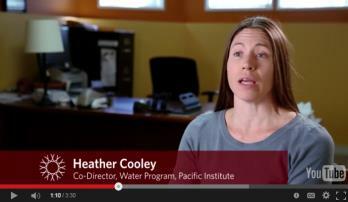 In addition, the Pacific Institute is expanding its work on water and equity. Staff participated in more than 80 different events ranging from talks, panels, workshops, testimonies, keynote addresses, and presentations-locally, regionally, and worldwide. Take a look at our in brief highlights or find the full list here. 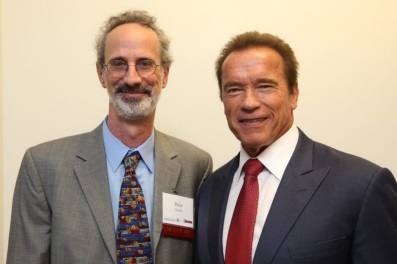 Peter Gleick, president of the Pacific Institute, participated on a panel at the “Global Climate Negotiations: Lessons from California” Symposium co-hosted by the USC Schwarzenegger Institute with the Air Resources Board and the R20 in Sacramento. The symposium – including participation from Cal EPA Secretary Matt Rodriquez and Governors Arnold Schwarzenegger and Jerry Brown – highlighted California groundbreaking climate change policies, reported the progress of California’s efforts, and critical lessons learned. The California drought has renewed an interest in seawater desalination, an issue the Pacific Institute has been tracking for more than 20 years. Last year, staff continued to brief officials and the public on the key issues associated with implementing and using this technology. 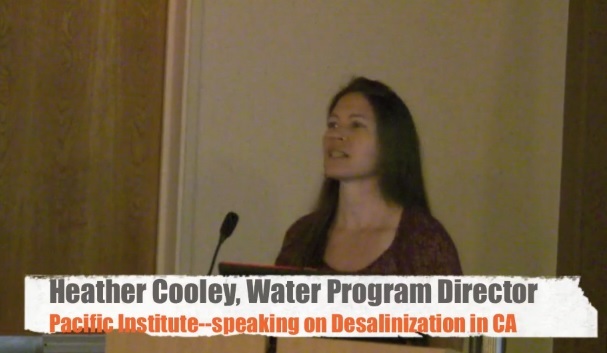 Water Program Director Heather Cooley testified at a California Assembly Select Committee on Coastal Protection hearing, informing the committee of the impacts of desalination. Ms. Cooley also presented the challenges and benefits of desalination at a brown bag event with the Delta Stewardship Council in Sacramento. 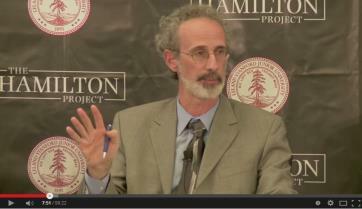 Peter Gleick testified on strategies for addressing the California drought to the California State Water Resources Control Board (SWRCB). Recognizing the drought has far-reaching effects likely to intensify if dry conditions persist, Gleick offered key recommendations from the Pacific Institute for changes in strategy, policy, and approach to greatly expand the efficiency of urban water use in California. Last year, Pacific Institute staff authored more than 40 blog posts to further inform its readers on timely water and sustainability issues.These works included topics from water conflicts in Syria, the California drought, and a breakdown of the corporate water disclosure guidelines. Take a look at the full list here. *The Institute’s work was referenced and its staff quoted more than 1,700 times last year in some of the world’s largest media outlets. Take a look at the highlights. Continued work on assessing the risks and threats of drought in California. The impact oil and gas production has on water supply and agriculture. “Where We Agree”- the Pacific Institute will convene diverse stakeholders to explore areas of agreement on California water use and management. A path forward for the Salton Sea. Guidelines to manage and improve integrity in water stewardship initiatives. Launch new online portals for the Water Action Hub to promote collective action in companies’ supply chains-specifically within the agriculture and apparel industry. A new assessment of the cost of different water supply and demand management strategies. The Institute provides analysis and solutions to some of the most pressing challenges of our day through generous gifts from foundations and people like you. Please make a gift today to help us achieve our ambitious goals for 2015.